Call it ‘recession’, or call it ‘austerity’. We know what is meant. The public purse is depleted. If we are to shift, we must shift for ourselves. This forms part of the wider context of two relatively new phenomena, at least in so far as they have taken recent institutional shape: Play Streets; and pop-up adventure playgrounds. Play Streets, in the UK at least, involve local residents seeking permission to close a street to cars for ‘x’ number of hours per week. As far as I know, closure is only allowed for a few hours. They rely heavily on the voluntary efforts of local parents, to supervise and provide general oversight of the play street session. After the allotted ‘play time’ is over, the street reverts back to its usual status and function. Pop-up adventure playgrounds can, in principle, ‘pop-up’ in any space, public or private. An unloved, or underused park or open space perhaps; or a shop unit whose retail function has been felled by that recession mentioned earlier. There is something beguiling about both phenomena, not simply because of their play function, but because they appear as cousins to the ideas and ideologies informing ‘meanwhile places’, reclaiming the street, and ‘pop up’ this and that – restaurants, bars, raves, etc; and temporary sort-of-squatted artist studios/living quarters that put to use empty buildings for which the market can find no immediate use. Let’s take it as read that kids playing is a good thing. And it would be churlish not to welcome the two initiatives. Indeed, they are to be welcomed. But we need to notice some features common to both that suggest critique and caution are also required. Not of the initiatives as such, but of their potential meaning, of what they illuminate, of what they may unintentionally obscure. 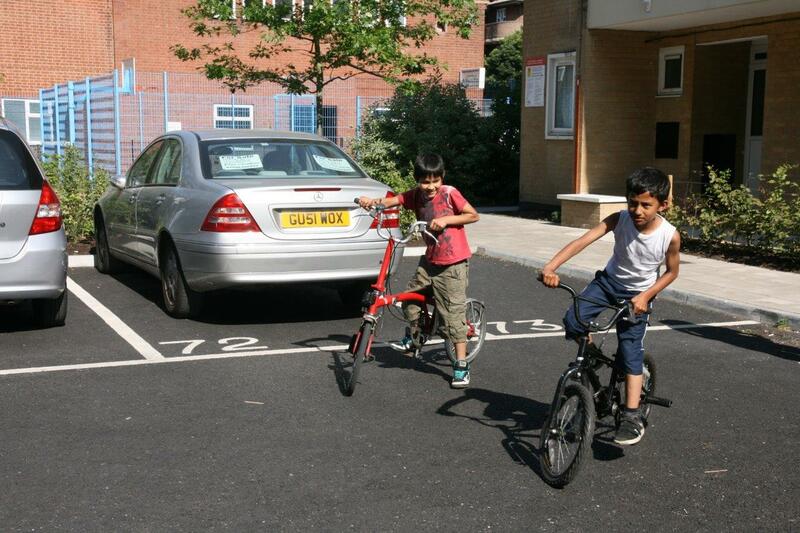 So far as Play Streets are concerned, they rely on children being supervised by adults. Whether or not this is ‘light touch’ supervision or more interventionist probably depends on the individual parents involved. But what is always the case is that the children are under adult supervision. And quite apart from the bureaucratic procedures that adults need to navigate to secure the necessary permissions for closing a road, there is all the paraphernalia of running a play street. This can include adults wearing high visibility jackets, red road closure signs, and tape running across the road. In one I visited, from a distance, it was uncertain whether I was walking towards a war zone, site of an accident or – phew! – a play street. All of this is simply in the nature of what we may soon be calling the ‘institution’ of play streets. That is actually a telling term – ‘institution’ – for if one looks at London Play’s brief history of play streets there are photos of kids playing in the street. In one of the pictures no adults are present (except in the far distance walking away). In the other, the adults seem to be watching some sort of display by the kids, rather than ‘supervising’ them in the way that term suggests. And for some readers at least, playing in the street was something we just did – this not simply misty-eyed nostalgia – in the delicious absence of ‘supervising’ adults. The point here is that, historically, playing outside, and play streets so designated, did not require the supervising adult eye, nor adult organisational efforts. From this perspective, Play Streets can be seen as a retreat rather than an advance: for children to be in their own street, the street has to become, in effect, a non-street, divorced from the wider public realm to which it properly belongs. 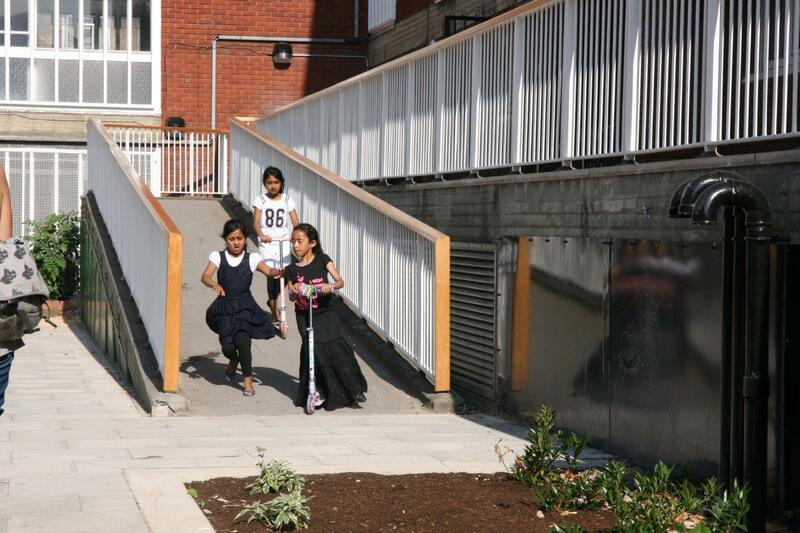 We need also to notice that teenagers are unlikely to be well-served by play streets. The response to this could be, so what? They have other places and spaces to congregate. Except they generally don’t, apart from the standardised response to teenagers: a MUGA or wheel park. Play streets are a self-limiting resource, they can ‘serve’ a street or two, but no more. Kids not in the near vicinity of the formal play street are unlikely to benefit; and it is not rash to assume that if there is one play street within an area, another one will not be allowed nearby. Even assuming that adventurous councils institute a rolling, repeating programme of Play Street closures, this simply moves both the scarcity and the resource – two sides of the same coin – around. The wider, strategic, concern is that the highly localised play street will, inadvertently, divert our attention from the pressing need to legitimise children and teenagers in unsupervised shared and communal space. Pop-up playgrounds are also to be welcomed. But they too depend on adult supervision, though they are underpinned by a commitment to playwork principles (‘low intervention/high response’ and so on). Pop-ups are, in part, a general response to recession and austerity. To the degree that pop-up playgrounds use premises that market conditions have rendered currently unlettable, the initiative is dependent on hard economic times. If and when the economy picks up, all things being equal, landlords and land owners will want to secure revived market rents and rising market sale values. So, the degree to which the pop-up play approach in shops and warehouses is sustainable, has to be open to question. But since permanence and pop-up are two mutually exclusive concepts, there can be no in principle objection to pop-ups just because they will have to move on – or disappear – one day. The here and now counts. We are required to make of it the best we can. So pop-ups need to keep, well, popping up. For artist, read pop up play in a shop. Along with a number of luminaries in play, urban design and landscape architecture, last week I went for a sunny, summer’s day stroll around the Ocean area of Tower Hamlets. A process of ‘regeneration’ is under way, with significant redevelopment of some local authority blocks of flats and other improvements, including reconfiguring the spaces around other flats and houses. The changes are sufficiently complete to get a sense of the place, to see how it is working in practice. Liz Kessler, free-lance urban designer, and one of our co-strollers that day, had been responsible for articulating the vision and preparing design considerations for the communal open spaces around the remaining flats and houses. One aspect of the changes that seems to have been successful, at least in the immediate term, is the creation of more people space, as distinct from car space. In brief, an audit of car parking space and an audit of residents’ car ownership was undertaken. The result showed there were more parking spaces than necessary. This allowed for a radical freeing up of outdoor, communal space, and its subsequent reconfiguration. Where previously there had been car parking, and internal estate streets, now there is grass, planting, land mounding and hard surfaces, clearly for use by people as well as vehicles. In two blocks there are some play structures. Broadly speaking, they are sympathetic to their local context. 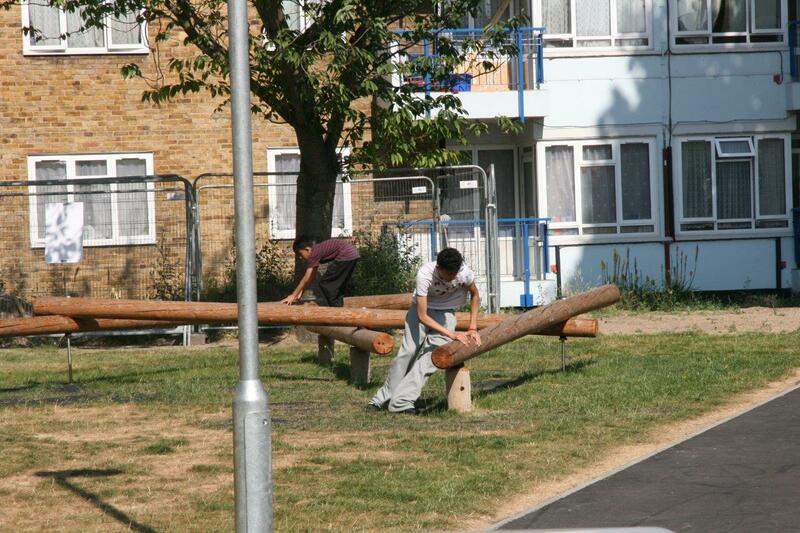 But for the estate’s children and teenagers, play specific structures are simply one aspect of a more widely usable – and used – communal realm as witnessed by the amount of children sitting on the benches, and riding their bikes and scooters. Children and teenagers from two years of age to eighteen were out and about. We were witnessing a repopulated communal realm, with children very much in evidence. Given the paucity of child presence in the general outdoors, seeing children – unsupervised – simply ‘around’, reminded me of those programmes aimed at reintroducing endangered species into the wild. And, as with such programmes, what counts is habitat. In other words, how space is designated and shaped – materially, culturally, politically – determines whether or not a habitat will be life-sustaining. It’s early days yet, it will be interesting to walk the area again when the changes are no longer new. But at the time of our quite extensive stroll, we seemed to be witnessing ‘affordances’ coming to life. ‘a particular way of appreciating children’s relationship with their environments, what a particular environment might afford for children’s play (for example, a low wall affords walking on, a tree affords sheltering under, hiding behind, acting as a counting base for games, or climbing). There is much to commend the play street and pop-up phenomena. They are, at the local level, forms of activism rendered necessary in the absence – ‘failure’, is perhaps a more honest assessment – of any real, wider progress towards realising in action those phrases to which we have become attached: ‘playable places’; children in public spaces as indicator of a healthy society; and one that PLAYLINK has used for years, and years, and years, and…’Children and teenagers being seen and heard in shared public space is the hallmark of a society at ease with itself’. The cautionary note to be sounded about Play Streets and pop-ups is that, by creating some children’s play opportunities in designated places, for designated periods of time, always in the adult eye, we may inadvertently contribute to delegitimising children and teenagers’ presence in the wider social realm. In welcoming these initiatives, we must not allow ourselves to be distracted from the wider, infinitely more difficult, task. This entry was posted in Play in public realm and tagged adult eye, Play Streets, Popup playgrounds; parents, public realm, urban design. Bookmark the permalink. Street Play: more children playing out, more parents getting to know their neighbours, better understanding locally of the importance of children being able to play out – what’s not to like? I’m struggling to see the downside. Give it a try – you might find you like it. Bernard, as I am preparing to mount our first pop-up play events here in Toronto, I found your article very thought-provoking. What you are writing about is the failure of the so called “neo-liberal” city (some might call it the neo-conservative city) to produce adequate enhancements of public space, while intensification continues to erode the historic commons of the street and open grounds, except, it seems, in some very specific places – low-income housing developments, where car ownership is unusually low, people are not generally mobile enough to seek their leisure pursuits further away and there is still some sense of public responsibility for these areas. (Social housing has a history of innovation in architecture and urban design) What you are asking for is a very difficult and fundamental shift in city building that we can only hope will evolve in the coming decades as more of the world will be living in cities and cities, including public amenities, such as they may be, will be built through private development. In other words, we need a stronger regulatory framework that protects and enhances the public realm. It will indeed be exceedingly difficult to entrench the idea of playable space and all that it implies into planning practices, because what we have or what we once had of that experience was accidental and took place in a world where spontaneous encounters could still take place. I liken this challenge to the awareness created by the environmental movement in the 60’s and 70’s. My parents’ generation thought that forests were endless and there was no need to protect them. But the boomers know that we are stewards of it all – even the parts we don’t see or understand. Let’s not talk about the apocalyptic visions and overwhelming responsibility my children have been schooled in – in lieu of actual playtime in or near nature. (See upcoming blog: Why is a child like a tree?) We are all feeling the squeeze on time and place in the post-modern city (any suggestions for a better descriptive name?). We step out to protect the children, but we know this is about everyone in a democracy. Pop-ups are programs, and programs are inherently fragile and transient. Like other programs for children, (the walking school bus, daily fitness activities, most playgrounds), they are instrumental focused solutions to problems that might otherwise be seen as overwhelming. We need these small scale reminders of what is possible, given even a bit of the right ecology of place. Someone’s experience, one sunny afternoon, may make the difference in that person’s life. I see the community development that takes place around pop-up events as opportunities to subvert the individualism and isolation that is built into much of the urban environment. Children suffer especially in socially denuded worlds. Pop-ups are the weeds that push through. But I agree with you that such programs run the risk of being perceived as the solution – when they are just provisional. It is so very useful to see case examples of neighbourhoods that are “working” well and to describe what is working and why, as a foundation for improved planning practices. This is no easy task. I encourage you to keep trying. Of course, neither play nor possession of a public realm nor access to nature should be specialized scheduled events. But, for now, this is an absurdity that we work with, while struggling, with your help, I think, to resolve the larger paradox. Human beings are individuals who want to be left alone AND social animals who crave the company of others – both – and often flitting back and forth between these two desires in the same minute. This is the paradox that play helps to resolve – but where? How do we build that paradoxical truth into an economic and planning system that is so absurdly tilted in the direction of the individual and the individual’s buying power? Thank you, Brenda, for a rich and considered response. You mention both absurdity and paradox. And here you have it right, for having eschewed the choice of only twiddling our thumbs in the gloom we are more or less obliged to ‘do something’, even when we see – if see we do – or fear that our ‘tactical’ (to quote Arthur) moves may not actually advance what we take to be our wider strategic objectives, assuming we have remembered to have them, and we know what they are. Our moves are, as you say, ‘provisional’. But they are not only that. Our moves also have meanings, often beyond, and indeed contradicting, the very values we hope to advance. I simply tried to identify the tension inherent in our ‘doing something’ but which nevertheless carries the danger of contradicting our wider purposes. (I allow myself the ‘our’ since I am acutely conscious of the deep vein of absurdity and paradox running through my own enterprises). I enjoy your philosophical musings, Bernard and would like to add my own. Thank you, Morgan, for taking the time and trouble to respond to the blog. I’m always slightly surprised to find that some people read it. On the matter in hand, I find it hard to find disagree with anything you’ve said. The rationale underpinning popup playgrounds that you set out in your comments is – unsurprisingly – cogent and no doubt helpful to those who don’t get it. However, I think I would worry if either popup or play street proponents took my piece as criticism of the ‘phenomena’ as such. I would worry on two grounds: one, that it is inaccurate. The piece in fact welcomed the initiatives; second, that it might indicate a tendency to over-sensitivity, that in suggesting that an initiative – any initiative – has not only its scope, but also its limitations, that this is, somehow, misplaced comment. I speak as one beset by limitations. My piece was simply an exercise in noticing what remains to be addressed. Popups and play streets, excellent though they be in their own terms, do not in themselves contribute to securing children and teenagers’ right to be a present in the unsupervised wider public realm. That there are potential unanticipated consequences attending these initiatives which, if we fail to acknowledge them, may in practice distract us from that wider task. But the points made here in no way constitute a case against popups or play streets. Arthur, just on the question of ‘tactic’ and ‘strategic’. Genuine question: is it not right to say that for something to be a ‘tactic’, it must be part of a strategey of one sort or another? If so, I suppose another way of expressing the cautions I raise is that Play Streets and popuplaygrounds may not work as – do not look like – a tactic supporting the wider stratgeic purpose of legitimising children/teenagers in the wider public realm. Play Streets and popups may – indeed in my view, are – justified in their own terms; and they also may be part of a tactic to….? Well, not quite sure about that, perhaps part of a tactic to have more of them. But if that the case, then the strategic objective is to have Play Streets and popups, and everyting done to get them going are the tactics. So, they may have begun to achieve their strategic purpose; and the strategy for legitimising children/teenagers – unsupervised – presence in the wider public realm remains to be formulated. Good, but not superb point. Logically and definitionally you are of course correct. And I was and am guilty of using terminology in a loose way as a shorthand in my comments. We have a lot that needs proper discussion to unpack for mutual benefit. Imho. I’m not getting into it either B, just to say that, whether or not we agree on what the task of playwork, or community development , or whatever the domain of practice is to which we refer, my points is that some activity is just tactical, and in order to be more than just an activity in its own right, it needs to be in the context of a strategy. I’m emailing you some excerpts from my presentation to the recent Geographer’s ‘play in austerity’ conference, which I think are relevant. That wider task I like to call”strategic playwork”. Pop ups and such are tactical. Oops, meant to also say, another excellent thoughtful piece, sir.